About the Children's Department: American Girl Doll Give-Away on my Other blog - grandma's cookie jar! American Girl Doll Give-Away on my Other blog - grandma's cookie jar! Okay, this post is not about children's ministry, but do you have a daughter, granddaughter, niece or grandniece who would love an American Girl doll? Do you know a daughter or granddaughter of a friend who would also love an American Girl doll? What about a neighbor girl? Do you know a family with a girl who would love an American Girl doll, but these dolls are just not in her family's budget? It is most likely you know at least one girl who would love an American Girl doll and I'm giving one away! 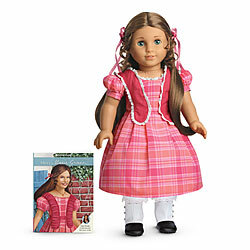 I'm giving away the new American Girl doll, Marie-Grace on my other blog, grandma's cookie jar! This drawing will be on December 1st so between now and then you can get at least one additional entry each day if you "share" my daily posts on grandma's cookie jar . . . I post a new article at least once each day - usually twice - and if you "share" these posts using the "share" tab on the facebook post, you'll receive another entry each time you share a post! I'm keeping careful track and on December 1st I'll have a drawing using the random draw program, The Hat.